Happy Birthday! 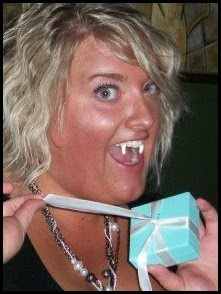 :D What'd you get from TIFFANY'S!? The SVC chipped in and got her a pair of earrings from Tiffany's. It was hard for me not to steal them. Very cool! How fun! You are a lucky Girl Jes! And what's Tiffany's? Obviously it's a store but...?? HAHA Z...So young! ;) Tiffany's is one of THE jewelry stores in the WORLD Their Blue box and White satin ribbon are Renown! Big bucks for most items! It's right up there with like Cartier (another worldwide known jewelry store!)! Jes is a lucky girl! I am very lucky!!!! I've got the BEST friends ever! I LOOOOOOVE my earings so much! Thanks for the bday post kari, I think I look good in fangs. Haha @ the fangs! Love them. Happy (belated) birthday, and the fangs are excellent!! Sorry, Kaitlyn. Nothing personal, but SVC birthday comments can only be happy. So your comment has been deleted. However, we do understand your being upset that we incorrectly drew fangs on our Miss Jes. We know real vampires only sparkle, have regular looking teeth and make you swoon with their spectacular scent--all things that Jes does on a regular basis.... You have been heard!